Before blossoming for his U-16 Boston Advantage squad, Adam Gaudette seemed over his head in elite hockey. Before blossoming for his U-16 Boston Advantage squad, Adam Gaudette seemed over his head in elite hockey. So much so that he nearly quit the game to focus on baseball. Now? He’s your Hobey Baker winner, part of a bright Canucks future and the force that helped Northeastern run with Hockey East’s big dogs. IN THE MIDPOINT OF COLLEGE HOCKEY’S biggest weekend, Adam Gaudette of Braintree, Mass., commanded the media spotlight. On live national television, he humbly accepted the Hobey Baker Award, the first Northeastern Husky to win the sport’s premier individual honor. No one in the media throng was aware that this newly anointed king of his sport nearly quit travel hockey after his first taste of Bantams. If not for a dose of tough love and some timely advice, Gaudette probably would be playing college baseball today. In recent years, youth hockey in Massachusetts has taken criticism for turning out fewer and fewer elite players. Its participation pyramid continues to steepen, with more players dropping hockey as their primary sport because of the increasing demands of travel hockey. 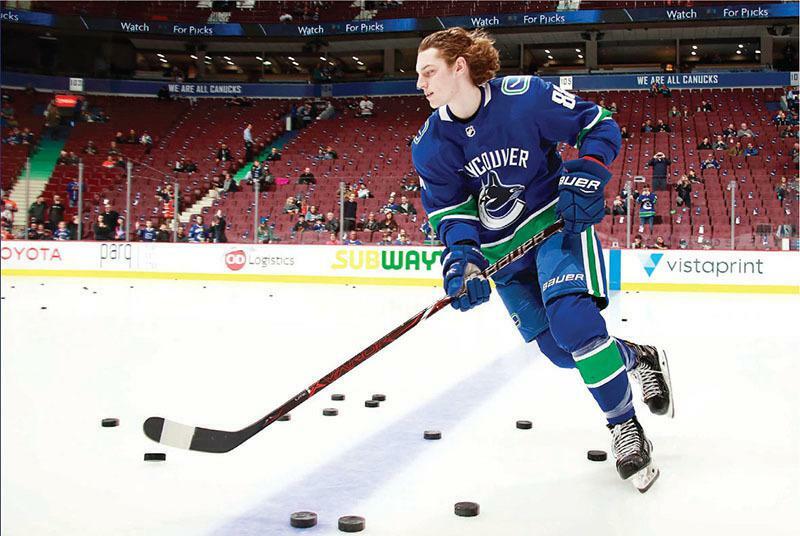 Consequently, the beloved "late bloomers," guys like Gaudette who need time to mature before reaching their hockey potential, are becoming increasingly rare in a sport whose players are asked to specialize so early. Gaudette’s crucial moment occurred shortly after Labor Day, 2009. He was just completing another excellent baseball summer in the heart of Red Sox Nation, pitching his heart out for Taunton West Little League. That fall he joined the Boston Advantage, a Lovell Hockey travel squad. It was Gaudette’s first exposure to U-14 hockey, coached by Joe Lovell, an old-school task master. Adam, cursed by an October birthday, found himself on the ice with players 18 months older than him, many already having benefitted from postpuberty growth spurts. The 12-year-old Gaudette was lost on the ice that day in Hingham, Mass., and Joe’s whistle never stopped blowing. "I remember his first practice," said Joe’s brother Tim, founder of Lovell hockey. "The way he did 150 pushups for not moving his feet, or not picking up his guy. We’re pretty tough on what you had to do right." For the first time in memory, the ebullient little Adam had a lousy time in the rink. "After the first practice he said, ‘Dad, I want to quit, I want to do baseball full time,’" said Lovell, a man who had known the Gaudette family ever since Adam enrolled in the Lovell skills program six years prior. "He was excelling at baseball," said Adam’s father, Doug Gaudette, a firefighter who moonlights as a plumber. "I remember him saying, ‘I’m not as good as the other kids. I just want to do more baseball than hockey.’ It’s tough when you’re not excelling, you see kids going by you, you lose interest. That’s kind of what was happening to him." Doug and Tim had a meeting of the minds shortly after young Adam sought to pull the ’chute on hockey. "If he (Tim Lovell) had said to me, ‘The kid isn’t getting it, you’re basically wasting your money,’ then I don’t know, let’s play baseball I guess," said the father. But Tim Lovell knew Adam’s game and character intimately from having trained him from age 6. He spoke out at a potential life-changing moment. "He has a lot of hockey sense, he makes the right plays, he’s going to get bigger," said Lovell. "I wouldn’t give up on the kid." Armed with that knowledge, father gave son a blunt dose of reality: "We paid for this, we’ve been with Timmy for a while, so you’re going to stick it out." For the next three years, Adam waited for that promised growth spurt and learned how to be an honest hockey player under the Lovell brothers at Boston Advantage. Every mental lapse earned him face time with the ice. "We always joke about all the pushups that Adam had to do," said Doug. "He didn’t grasp the system, he’s playing against older kids, and it was tougher." The father laughs at Adam’s memories of those early struggles. "I did a thousand pushups the first month of U-14’s," Adam recalled. Dad had one reply to all of his son’s complaints after on-ice brushups with Joe Lovell’s will. "I don’t know, Joe knows the game, so just listen to him, and figure it out." Adam must have heard that phrase in his sleep during his five years playing for the Lovell brothers: Figure it (the hell) out. It’s also a phrase echoed in the Gaudette household, and Adam soon did just that. When other kids were relaxing in the spring and summer, he was seeking out ice time, joining his younger brothers in PeeWee skill sessions to improve his skating. He had already become a responsible two-way forward for the Advantage U-16 squad when his growth spurt finally arrived. No longer an undersized role player, Adam blossomed into a star. "I think his 16-year-old year was his coming out party," said Tim Lovell. "He grew a lot, and his body got more coordinated." 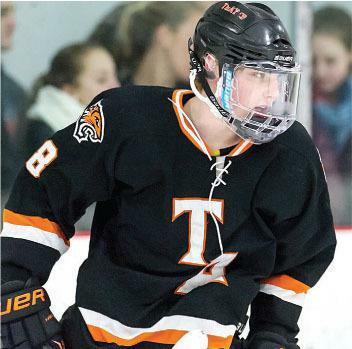 Gaudette split his season with both Thayer Academy and Boston Advantage. His days of getting knocked off 50/50 pucks and losing races were over. Once comfortable in his new physique, the kid from Braintree punished the ISL with an astounding 67 points in 27 games. A year after reaching puberty, he had clearly outgrown prep school hockey, and bolted for Cedar Rapids and the USHL. It was more than active hormones that molded Adam’s new body. It was his voracious appetite for his work on and off the ice. Pro trainer Tom Boothby of Hingham puts Gaudette in a class by himself when it comes to gym work. "Adam is an outlier," said Tom from his office at Boothby Training. "He dictates the pace. You have to try and keep up." Like all teenage elite prospects, things began happening in rapid succession for Adam: He committed to Northeastern, he became seasoned in the USHL (30 points and 50 penalty minutes), and he was selected in the 2015 NHL Draft (Vancouver, fifth round). A lot of kids that age would find their heads spinning and their hats expanding with all the attention and back slapping, but not the eldest son of Doug and Tara Gaudette, who helped him retain his bedrock Boston values. "I knew right away I wanted to play in the Beanpot," said Adam. "I kind of got passed up by some schools, and Northeastern was the first to offer. It was the perfect fit, a 25-minute drive from home." Gaudette wasted no time asserting his indomitable will on the Northeastern program. In one of his first practices at Matthews Arena, the freshman ushered in a new era of Husky intensity. They were running a routine drill, when Gaudette blasted senior captain and scoring star Kevin Roy. The skating halted, and the ancient arena became silent. "He finished a check on Roy, which upset Kevin and some of the older players," said NU sports performance guru Dan Boothby. "They felt Adam was trying to be a hero. I think everyone quickly realized after that practice, that was not the case. Adam only knows one speed — win!" The Huskies endured a crossroads season in 2015-16, represented by the respective production of the freshman and the senior. Roy endured a season-long slump, while rookie Gaudette systematically learned what it took to score, and win, in the Hockey East jungle. He heated up toward the end of a landmark freshman season, pounding in postseason goals vs. BC and Lowell. The Huskies finished off a miraculous run to their first Hockey East tournament title, clinching a rare trip to the NCAAs. 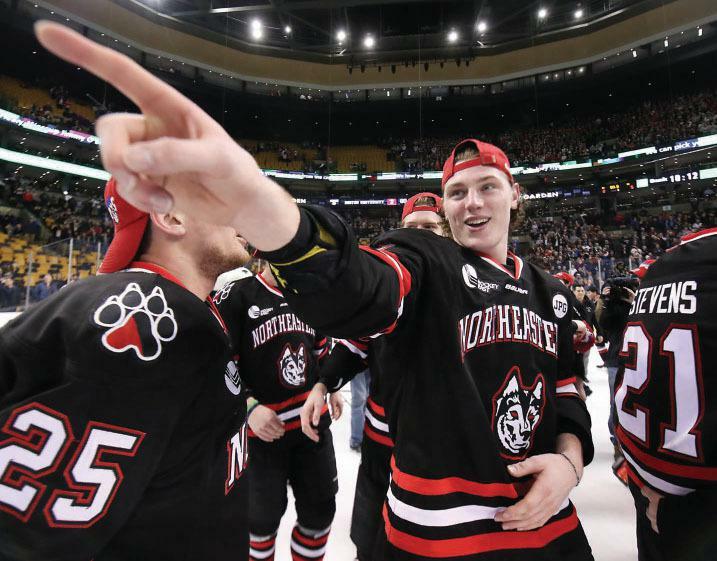 Two years later, no miracle was required, as Gaudette and company generated offensive fireworks all season long, powering the Huskies toward the top of Hockey East. 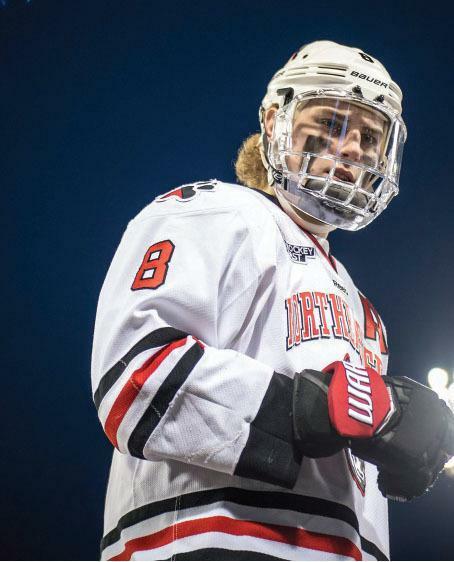 Suddenly Northeastern was no longer the weak sister on a Division 1 road trip to Beantown, and during Gaudette’s three-year college tenure, they forged an impressive hockey identity. 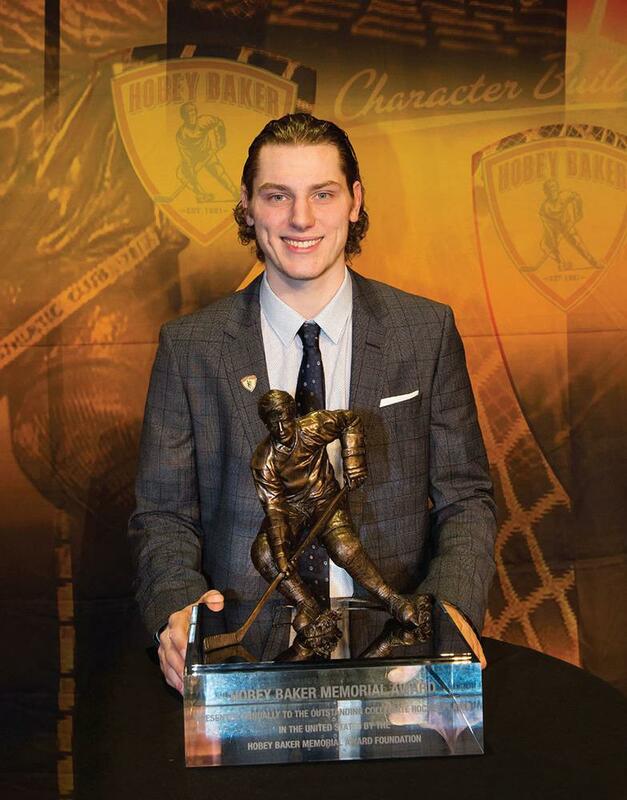 "Now we’re not being referred to as Northwestern anymore," said Gaudette proudly, from the Hobey Baker podium in April. "Everybody knows who Northeastern is; it’s really cool to be part of that." Fueled by Gaudette’s impeccable scoring stat line (30-30-60) and his explosive linemates — Dylan Sikura and John Stevens — the Huskies were in the Hockey East elite all season long. "He was the catalyst of that line," said Tim Lovell. "He’s got a ridiculous motor, a 200-foot player." Moments after Gaudette captured the Hobey, coach Jim Madigan (Milton, Mass.) was gushing over Gaudette helped Northeastern join a historical club. "In the Boston area, we can now say all four Beanpot schools have produced a Hobey Baker Award winner," said the beaming Madigan. "We were the last ones to the party, but we’ll take it." Gaudette concluded his three-year Division 1 career with some sensational accolades: the Hobey, the 2018 Walter Brown Award and a first0team All-America berth. But it was a team accomplishment that ranks highest on this loyal Bostonian’s college hockey hit list. He mentioned it as soon as he got onto the national podium in St. Paul. "Winning the Beanpot for the first time in 30 years," said Gaudette into the microphone. "That was something not a lot of people would understand if you’re not from Boston, but that just meant so much to me, and the team, and the school, and the community." Gaudette was the 2018 Beanpot MVP, on the strength of his hat trick against BU in the final, the school that spurned him five years prior. His father recalled checking out Boston schools with his son before signing his letter of intent. "I remember talking after we went on the visit to Northeastern. ‘What would be nicer, to win a Beanpot at Northeastern, or BU?’"
"Northeastern, oh yeah," said Adam in a heartbeat. "You win at Northeastern, it’s a big deal." Years later, summing up his remarkable college career to a media throng in the midst of the Frozen Four, Gaudette made a point of sharing his Boston pride in winning that historic ’Pot. "To finally get that win after 30 years is something out of a storybook," said Gaudette to the press scrum. "We’ll be looked at as heroes in Northeastern history." And thus ended the storybook college career of the hockey force that is Adam Gaudette, Boston’s late-bloomer who now has Vancouver hockey fans Googling the Beanpot. 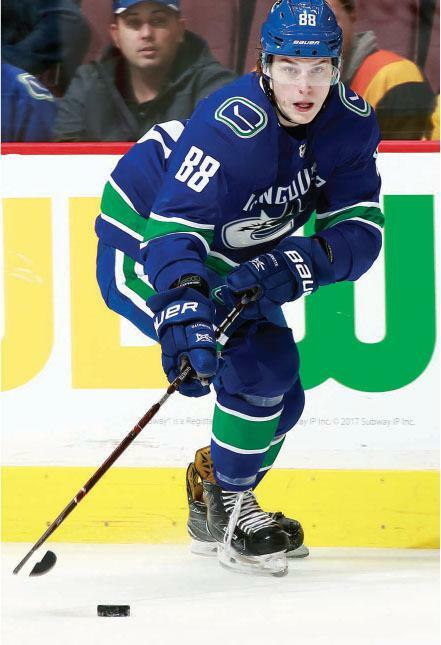 By the time he made it to the Hobey ceremony in St. Paul, Gaudette already had played five NHL games with the Canucks, signing his pro contract days after playing his NCAA regional in Worcester. Repeatedly crisscrossing North America had Gaudette’s head on a swivel. "It’s been crazy, getting settled in," said the NHL newcomer, "trying to learn as much as I can from all the older guys, try and get adjusted on and off the ice." Tim Lovell, who’s worked with Gaudette for 15 years, already noticed his student’s progress in just five NHL games. "I watched his first game, and I watched his fourth game; I thought he looked better in his fourth. There’s not a kid who’s going to step in and rip this (league) apart. I think he’ll adapt quickly, he’ll figure it out. (Canucks coach) Travis Green’s got a player that’s going to play up and down the whole ice surface, versus just an offensive guy." "To get these five games in is huge," said Gaudette. "It’s going to show me what I need to work on this summer, and hopefully come in next year and be ready to go right away." If you happen to see a video of Adam conducting a bare-shirted interview from the Canucks locker room next season, check out his right shoulder and biceps. 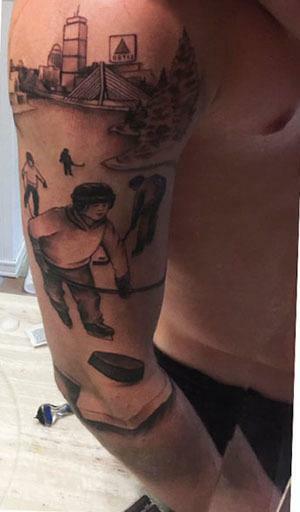 You’ll see an inked image of a pond hockey scene and the iconic Citgo sign above Kenmore Square, a tribute to Gaudette’s Boston sporting roots. 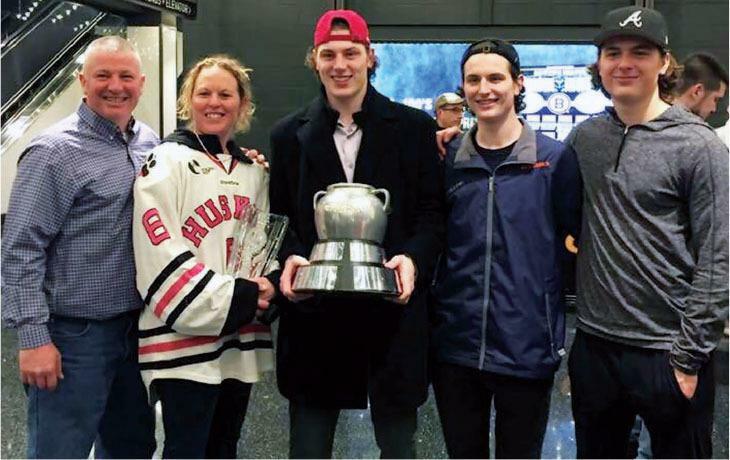 Had it not been for some heads-up parenting and the vision of his hockey mentors nine years ago, Gaudette would still be dreaming of pitching in Fenway Park, instead of hoisting the Stanley Cup. The New England Knights will be hosting their Jersey Fitting with Bauer in Raynham on May 14th from 5:30pm - 8:30pm. The 2018 USA Hockey National Championships this April at the U14/U15/U16/U18 levels had 7 out of 8 teams in the Finals that were full season teams (88% Full Season Midget Teams!!). We at Lovell Hockey are proud and excited about the explosion of Full Season Midget hockey in New England. If interested in learning more about full season options please visit lovellhockey.com or email info@lovellhockey.com. Knights 06 Elite's Win BHL American Championship!! Girls and Mite Open Tryout Annouced! ©2019 New England Knights / SportsEngine. All Rights Reserved.